When you visit, you will find yourself nestled between three majestic mountain ranges that yield a moderate year-round climate. The Olympic Mountains' "rain shadow" allows for a surprisingly comfortable and sunny climate. Though the Pacific Northwest receives significant rainfall, this oasis is a "banana belt". As Pacific storm fronts pass through the area, rainfall is deflected as the systems rise above the ranges creating a drier and more temperate climate than other parts of the region. This effect, combined with the natural habitat, makes the San Juan Islands an optimum choice for your vacation plans. From check-in to checkout, experience the special touches that make Ship Harbor the best choice in the Pacific Northwest. Choose from a well-kept, top quality fleet that will exceed your expectations. Ship Harbor Yacht Charters rewards you with comfort, safety and a staff that is second to none. At Ship Harbor Yacht Charters, you have choices. From novice to expert sailor, we have the right vessel for your charter. We can provide a captain or even a crew for your journey. Trust our experience and intimate knowledge of the San Juan and surrounding islands. 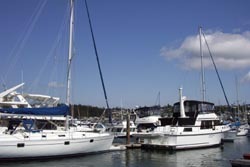 Ship Harbor Yacht Charters gives you the local flavor you look for as you embark on your Pacific Northwest adventure. The San Juan Islands are one of the top 3 sailing destinations in the United States for good reason: waters rich in the sea's bounty and forested islands that embrace wildlife. Watch orcas, whales, seals, sea lions, Bald Eagles and shellfish in their natural environment. Share the beauty of the San Juans with deer, small game and migratory birds. It's the attention to detail that makes Ship Harbor Yacht Charters your best choice. Our staff makes you and your family part of ours the moment you walk through the door. Personalized service is what makes Ship Harbor Yacht Charters so different. You and your family may even board your vessel the night before you leave port. 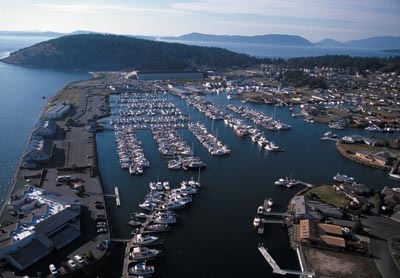 We may assist you in arranging lodging in Anacortes. We can plan a romantic candlelight dinner to celebrate a special occasion. 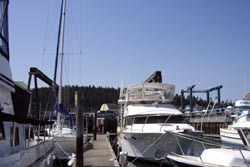 As you leave the Skyline Marina dock, rest assured that you have the experience, efficiency and dedication of a staff that guarantees comfort, safety and, most of all, complete fulfillment with your San Juan island vacation.